The diamond dove is so named because of the many white spots dotting its upper wings. The diamond dove is native to Australia, where they are found in the dry deserts in the north and central parts of Australia. 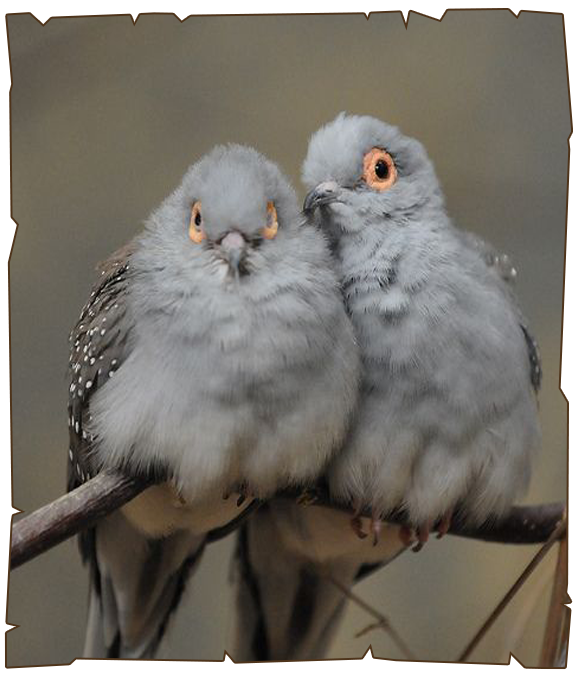 Diamond doves are one of the smallest dove species in Australia. The Diamond Doves are small, greyish doves that measure from 7.5 - 9.5 inches, including their tails, which are about 4 inches long. The upper parts are mostly brown grey and the belly creamy in color. Both males and females have upper wings with distinctive white spots and black edges. Their eyes are orange; the bills are dark grey; and their legs and feet reddish or pink. Diamond Doves are usually seen foraging on the ground in pairs or small groups. They mostly feed on seeds from herbs and grasses. To a lesser extent, they will also take ants. Within their natural range, they may breed throughout the year; but most breeding activities are observed after heavy rainfalls.